Reshape Your Ears with Otoplasty in New York. Many people are bothered by prominent, poorly shaped, or over-projecting ears. For children, large or protruding ears can be particularly troublesome as this condition often leads to social embarrassment and teasing. Ear reshaping (otoplasty) is a surgical procedure that can help set prominent ears closer to the head, correct poorly defined ear folds, and bring balance to asymmetrical ears. The goal of otoplasty is to shape natural-looking, well-positioned ears that are in harmony with overall facial aesthetics. 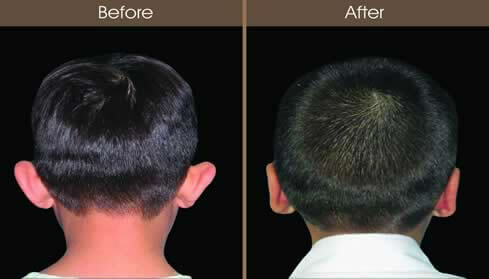 Ear reshaping is a common procedure for children as young as six to seven years old. By this age, the ears have grown to nearly their full adult size. Many parents elect to have the procedure done early in order to protect their children from teasing at school. Otoplasty can also be performed for older children, teenagers, and even adults who are self-conscious about the size, shape, or position of their ears. WHAT CAN EAR RESHAPING (OTOPLASTY) DO FOR ME OR MY CHILD? Who is a good candidate for ear reshaping (otoplasty) surgery? People who are unhappy with poorly shaped or over-projecting ears may be good candidates for ear reshaping surgery. Ear reshaping can be an excellent option for young children (as early as six or seven years of age), older children, teenagers, and adults. 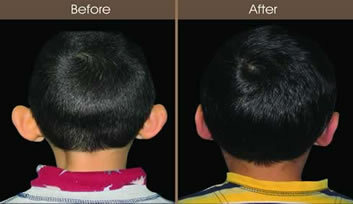 Dr. Levine will gladly meet with you to discuss whether you or your child is a good candidate for ear reshaping surgery. How is ear reshaping (otoplasty) surgery performed? Dr. Levine uses a variety of techniques to reshape and reposition the ears. All incisions are made behind the ear, where they will be well-concealed. Ear cartilage may be repositioned and rotated to create more natural ear folds. Sutures may be used to set the ears back closer to the head. In some cases, cartilage may be removed to reduce the size of the ears. Dr. Levine will discuss with you which technique or combination of techniques may best suit your specific needs. Where do you place incisions for ear reshaping (otoplasty) surgery? Small incisions are made just behind the ear, in the natural crease between the ear and the head. Any scars from otoplasty will be well-concealed. Can ear reshaping (otoplasty) surgery be combined with other procedures? For children and teens, otoplasty is usually done as an isolated procedure. Adult patients may elect to combine ear reshaping surgery with other body contouring or facial aesthetic procedures, such as liposuction, fat transfer, facelift, blepharoplasty, and browlift. Dr. Levine will discuss with you which procedure or combination of procedures may best suit your specific needs. How can I prepare for ear reshaping (otoplasty) surgery? During your initial consultation, Dr. Levine will examine your ears and overall facial aesthetics. He will also address your medical history and discuss other factors that may affect ear reshaping surgery, such as previous surgeries. He will thoroughly discuss your goals and expectations, including possible risks and the best way to prepare for your surgery. He will let you know what to expect before, during, and after your procedure, and he will answer any questions that you may have. The type of anesthesia used will depend on the age of the patient, as well as the extent of the procedure. Anesthesia options range from twilight sedation to general anesthesia. You will discuss your procedure thoroughly with both Dr. Levine and our board-certified anesthesiologist to determine the best type of anesthesia for your needs. What should I expect during ear reshaping (otoplasty) surgery? Ear reshaping surgery is either performed on an outpatient basis in our state-of-the-art, in-office operating suite — which is accredited by the American Association for Accreditation of Ambulatory Surgery Facilities (AAAASF) — or in the hospital, depending on the age of the patient. The length of the procedure will depend on many factors, but on average, the surgery usually takes 2-3 hours. * After your procedure, you will wake up in our warm and caring recovery suite, where our licensed, registered nurse will make sure you are comfortable and assist in your recovery. You will be able to go home the same day with a friend or family member. What can I expect after ear reshaping (otoplasty) surgery? Every surgery is different, and you will receive detailed post-operative instructions for your specific needs. In general, you can expect to have head dressings for 2-3 days after surgery. Most patients report mild to moderate pain after the surgery, which is usually well-tolerated with medications. * At Plastic Surgery & Dermatology of NYC, our concern for you doesn’t end when you go home. We’re dedicated to providing ongoing care to ensure a fast, safe, and smooth recovery. Dr. Levine will see you for post-operative visits, and he and our staff stand ready to answer any questions you may have about your recovery, as well as your overall health and well-being. How can I find out more about ear reshaping (otoplasty) surgery? Dr. Elie Levine will be happy to meet with you to discuss ear reshaping surgery. Please call our office at 212-988-1800, or make an appointment online for a personal consultation in our New York City offices.